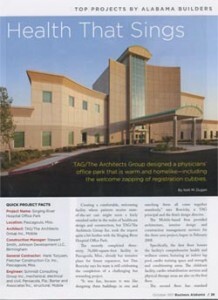 The recently completed Singing River Hospital in Pascagoula, Mississippi was featured in the October 2011 issue of Business Alabama. Business Alabama covers business, large and small, in all sectors of the Alabama economy. From emerging technologies to vital manufacturing clusters, Business Alabama has been tracking the growth of the Alabama economy for two decades. Click here to view a pdf of the article. You can learn more about their publication at www.businessalabama.net .